So, um . . . it’s bigger. Here’s the previous post about it, if you want to compare. I’ve been getting enough bad comments (read “worried”), that I did go by the on-campus medical center just to have it checked out. They did, but they told me that this just sometimes happens and there’s not really anything that can be done about it. In addition, I have another friend who works at the library on my campus, who suggested that I use moist heat on it. He had recently gotten a really bad bruise and had found that that had really worked well for him. At this point, I’m accepting suggestions. ~ by lastcrazyhorn on April 3, 2008. Yea, it’s a pretty big bruise. I would continue the present therapy, and expect it will go away in about 2 weeks or so. Or you could do nothing, and it will get better in 14 days or so. It’s totally normal that it has gotten bigger, as it is diffusing through the tissues and being reabsorbed. You may even get a little discoloration down to your wrist. You can follow Joe’s advice or stand on your head for 20 minutes after drinking 3 glasses of water 3 times a day and it will go away in a fortnight. 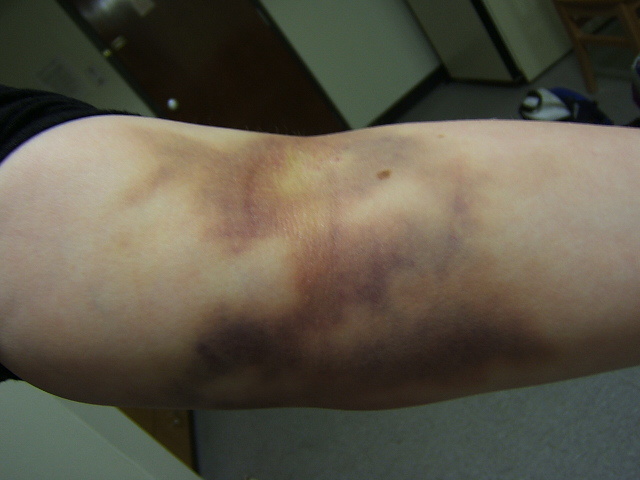 This has happened to me from a vein puncture before. The vein didn’t clot properly, and blood leaked down into your arm. When this happens to me, it is always that I’ve failed to be careful enough with that arm after it was punctured: particularly bending it and carrying heavy things around with it for the hour or two after the puncture will cause this for me. Does look nasty, huh? But unless you have a clotting problem you know about, consider it a wake-up call to treat that arm more gingerly after you give blood for a couple of hours. I think sometimes they shred the entry point a little if they are using the big needle, and that can make it worse. I left the bandage on for 8 hours and didn’t pick anything up with that arm for 24 hours . . . mostly because it hurt too much to do so. Sunday, when I donated blood, I couldn’t even put my hand behind my head. And I definitely don’t have problems clotting. I clot pretty fast, actually. Hi, I read your most recent entry but I think I clicked something wrong and ended up commenting to the one before it (can you tell I’m new here, from Livejournal). Can you please tell me how you get the links in the side of your blog, because that’s what I’ve been trying to do in the short time I’ve been here, that and to find out how to add other people I know here, and I can’t work out how to do it. This thing is weird (and I came from blogspot to wordpress without realising I changed sites, they must use the same software).